This article is re-posted from student Olivia Cousins’ article ‘Community, Technology, Sustainability’, originally published on her blog: Meristem Journeys. 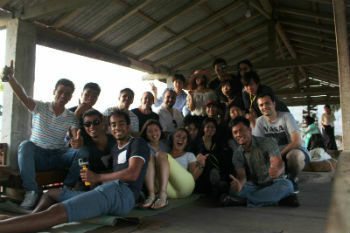 Olivia went to the AC21 International Graduate School in Yogyakarta, Indonesia in July. Three important words. Community. Technology. Sustainability. In this day and age it is absolutely crucial that our scientific advances become more sustainable if we are to maintain and grow our agriculture communities and develop better technology for feeding and taking care of the world. Last week I attended the AC21 International Graduate School at Universitas Gadjah Mada in Yogyakarta, Indonesia. Around 45 students attended the week-long summer school, with Indonesia, South Africa, Australia, Americas, Europe, Thailand, Japan and China represented. The title of the summer school was ‘Community and indigenous-based technology for sustainable development towards resilient society’. This topic was given to us through lectures, workshops, community service, internship and excursions. It was highlighted that universities need to become a bridge between the work they do (whether it is science or humanities) and the surrounding communities. In turn it can create a healthy relationship between university, community and aid in developing research-based community service. The two lectures that stuck with me the most were presented by lecturers from UGM. Dr. Murtiningrum not only highlighted the importance of soil in agriculture, but how water plays a role in soil physics and behaviour. She got us to think about how the area of arable soil available in Indonesia affects how the people farm. She got us into groups of 7, and told us stand on a piece of newspaper; at first, only one person was allowed on the newspaper, then 3, then all 7 group members. She made us think strategically in how to maximise space yet still fit all of our group on that newspaper sheet. This is how the Indonesian farmers must think, they must be strategic in their farming practices, otherwise they cannot maximise crop yields or economic yield. Prof. Irfan Dwidya Prijambada gave an energetic seminar on community empowerment for sustainable technology transfer. He is a key helper in developing community service projects for undergraduate students from UGM. Community service is compulsory for final year students. These students spend a few months, usually in a local village, getting to know the community. Whilst there, they share their knowledge to help set up a project that will benefit the community; in return they learn interpersonal skills, life skills, communication skills, and cultural skills from their village host. I saw some of the work Prof. Prijambada has done with communities and villages to create sustainable farming and economic ventures. 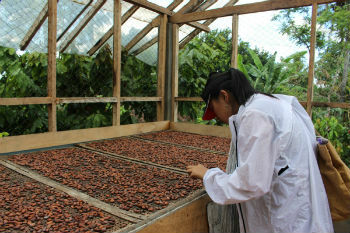 We visited a cacao plantation, where they grow and graft their own cacao trees, harvest the pods and process them. Once processed, they get turned into delectable chocolate! In addition to seminars, we visited UGM’s own agriculture school, and had a tour around the facilities. 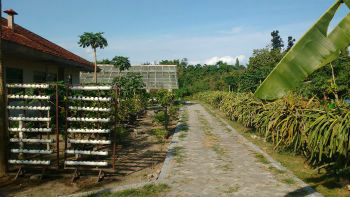 It has everything from livestock, to tropical fruit and veg crops, to biogas production to composting factory. It was encouraging to see how passionate the people were about the environment and recycling. We also participated in making traditional herbal medicine. Jamu is traditional Indonesian medicine, made from different herbs and spices to treat an assortment of illnesses or to improve vitality. We visited Merapi Farma Herbal where they turned jamu-making into a successful business. With the help of some of the workers, we made crystallised ginger. It was really tasty and did not taste like medicine at all! The week-long program reiterated how fast our world is changing, and how important it is to for communities to be able to keep up with these changes. Visiting the different communities showed me that people can be very resilient and adaptable to changing climates, both environmental, and socio-economical. This resilience is key to developing technologies that will improve community sustainability; in turn, the sustainable development of a community will improve its resilience. It was fascinating to meet so many people from so many different countries and cultures, many of whom came from totally different backgrounds to me. This program gave me the opportunity to mingle and interact with people across disciplines. And I can’t stress how important that is. Sometimes we get so tied down and stressed by focusing on one small aspect of the global picture, that we forget what our bigger picture is. Occasionally we need to come up for air, we need to get out of our bubble or comfort zone once in awhile and venture into the world of ‘that’s-not-my-field’. Who knows what knowledge we can gain by talking to people from another discipline. Who knows what collaborations are possible. You just have to get out there. AC21 IGS 2017, it’s been a pleasure. This entry was posted in Faculty of Sciences, Indonesia, Short Programs, Student Blogs and tagged AC21, agriculture, community, Faculty of Sciences, graduate, Indonesia, PhD, research, self-reporting programs, sustainability, technology, Yogyakarta. Bookmark the permalink.